Should you email someone your confidential spreadsheet? I read an article a while ago titled Trade secrets exposed by ‘stealthy’ email typo attack in the Sydney Morning Herald. It talks about a really subversive way hackers have been able to access many thousands of confidential emails. This got me thinking again of the risks involved in emailing confidential information like business plans, spreadsheets, credit card details and the like. I somehow intuitively feel like email provides me with a direct unimpeachable connection between me a someone else, but the truth is that email is a really vulnerable method of communication. It quotes a security expert Paul Sophos as saying “email as a communications medium was fundamentally insecure, so you should assume that all email might be read or at least scanned by someone else”. The social media phenomenon shows us that people are prepared to share their most intimate secrets and photos with the whole world. Does the same apply to sensitivity financial information? Does anyone really care whether email is a secure way to send around highly sensitive and confidential spreadsheets, or for that matter, any sensitive financial information? Please share we us the things you do to ensure that the information in your spreadsheets is kept secret when you want to communicate or send these spreadsheets to others. Although it is designed to get laughs—and Jim Parsons’ (Sheldon Cooper) comic timing is spot on—it got me thinking about user friendliness of software and raised some serious questions like: What does “user friendly” really mean? Can it mean the same thing to all people? And, is there such a thing as software that is TOO user friendly? 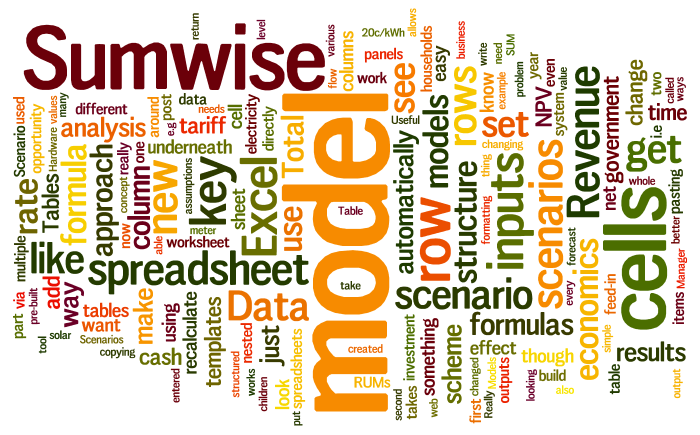 Sumwise’s solution to a very common spreadsheet modeling problem–managing repeating rows and columns. Consider how many times you use a certain set of row or column names multiple times throughout your spreadsheets and the difficulties that this presents. For example, let’s say you have a forecast for a business that has 2 products: Hardware and Software. You might land up using these row names multiple times throughout your model e.g. to forecast sales, units, and inventory. Further imagine that once you’ve built this model you decide you need to add another item to this list, say Services. To get this to work you need to find all the places where you’ve used Hardware and Software and add another row to this list. This involves copying and pasting, deleting unwanted contents, and a fair measure of faith that you’re not destroying part of the model’s logic. Other complexities can present such as changing the names of these rows, or reordering these rows and ensuring that the correct data goes with the correct row labels. None of the above is easy with traditional spreadsheets such as Excel or Google’s spreadsheet — in fact is extremely difficult to get a normal spreadsheet to deal with all of these (seemingly simple) pieces of functionality. We’re slowly ‘coming down from the clouds’ following a super busy and really inspiring couple of days at Google I/O 2011. Here’s our report on the major themes from the conference, and our experience hosting a Developer Sandbox stand throughout the 2 days. Spreadsheet templates hold such promise. A good template can save you hours of time you would otherwise spend creating your own spreadsheet, and gives you the benefit of someone else’s expertise. The sad fact though is that spreadsheet templates are fundamentally ‘broken’, and the concept of a good template is completely illusory. Act 1: A sad tale. Yesterday I needed a simple cash flow forecast model. Instead of firing up Excel or Google Docs and starting from scratch, I decided to look online first. So, I aimed my browser at the Google Docs template site and searched for a “cash flow forecast” spreadsheet. I got just 1 result! Undeterred, I clicked the button to preview this model and thought it was pretty close to what I needed—I could just add a few more rows, rename some things, and save myself some time and effort. 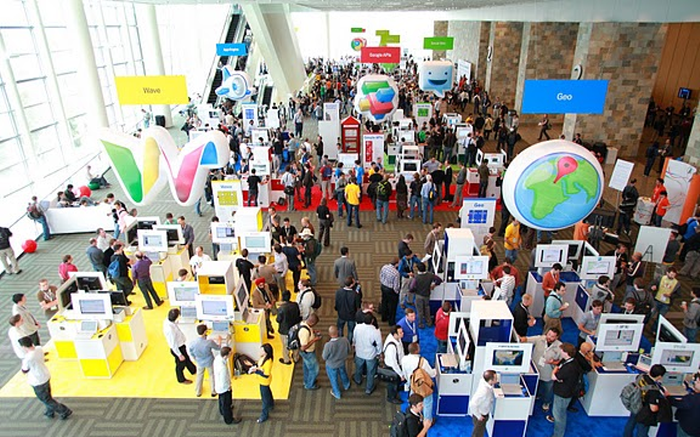 We’re pleased to announce that we’ve been selected to attend this year’s Google I/O conference. We’re excited to be part of this great event, and we’ll be manning a Developer Sandbox stand throughout the two day conference. Google I/O brings together thousands of developers for two days of deep technical content, focused on building the next generation of web, mobile, and enterprise applications with Google and open web technologies such as Android, Google Chrome, Google APIs, Google Web Toolkit, App Engine, and more. Our spreadsheet application is built entirely using Google Web Toolkit, and Sumwise is great example of a sophisticated desktop-like application that runs entirely in the browser. In addition, Sumwise is hosted in App Engine—Google’s cloud service. The Developer Sandbox will feature over 100 developers from around the world who have built applications based on Google technologies. These developers will be on hand to demo their apps, talk about how they built them, answer questions, and exchange ideas. If you’re going to be at Google I/O this year, please come by our stand and say g’day! Here’s what last year’s Developer Sandbox area looked like. In one of my occasional wanders through the interwebs I came across http://www.wordle.net which is a Java app that takes any bunch of words you throw at it and turns it into a word cloud — giving you a snapshot of which words appear most often. So, for a bit of fun I threw my blog feed at it, and here’s what came back. So pointless but so insanely cool! This week we announced the launch of Sumwise RUM – Really Useful Models that are pre-built and ready to use. With RUM we are taking spreadsheet templates to a whole new level! Imagine you have an idea for a new business, and you’re at the stage where you want to build a cash flow forecast to model its economics. What do you do? One option is to start your own spreadsheet from scratch and battle with the usual problems of writing formulas, copying and pasting, linked worksheets and the like. Not to mention trying to get your balance sheet to balance! Alternatively, you could search the web for an Excel (or Google Docs) template that matches your business type. But, now you’re dealing with a whole wasteland of dubious quality spreadsheet templates. And even if you find something acceptable, you’ll want to make changes such as inserting some new rows. But, are you confident enough to know which formulas need copying and pasting? And how will you know if the spreadsheet is still working properly? Also called scenario analysis and what-if analysis, perhaps the most useful feature of spreadsheets is their ability to run multiple versions of key assumptions through a model and present the effect on the key outputs. Here’s the scenario (excuse the pun) — let’s say you’ve built a whiz-bang model to help you decide whether it is worth making a particular investment. Just like every good spreadsheet model, it’s at the mercy of its weakest assumption(s) — and you can think of at least 4 or 5 key assumptions that you know are important, but which are uncertain. So, you go about plugging in different values for each of these, and observing the impact on the 2 or 3 result cells that you care about. What you’d really like is a neat and easy way to set up, view, and play around with, various scenarios of your investment model. Last month the New South Wales government significantly downgraded the highly popular Solar Benefits Scheme that was implemented just this year. What does this mean for households looking to install solar panels? Do the economics work any more? What does this have to do with Sumwise? In this post we will attempt to put aside all political, environmental, and technical aspects, and focus purely on the economics. We will aim to answer two questions: 1) Did the economics of putting up solar panels under the old scheme work? and 2) To what extent has the change to the scheme impacted the economics? We’ll demonstrate all of this with a working Sumwise model, embedded into this post below. Earlier this year the New South Wales government enacted a scheme whereby households who install electricity generating (PV) solar panels on their roofs get paid for all the electricity they generate. Known as a gross feed-in tariff, the rate was set at 60c/kWh—which is roughly 3 times the average rate that households currently pay for their electricity during daylight hours. But, on 27 October, the government cut the feed-in tariff from this generous 60c, to a less generous 20c. Also at HammerGamer.com you can read all about Paint the Town Red action game.